Luthier tools include tools and equipment that are particular to some aspect of guitar making and seldom used for anything else. Some of these tools you can make, some will need to be purchased from a reputable luthier supply company. Some luthier tools sold at the luthier supply companies can be unnecessarily expensive with more features than you need. Which makes it hard for me to justify the cost. Many of these tools you can make at a fraction of the cost. This can save you some money and are generally nice easy projects. For other luthier tools its the only place you will find them. You need to be an educated shopper. Some specialized luthier tools are absolutely necessary to build a guitar. Bending tools and radius sanding tools are a few items you simply have to have. You can make both these types of tools yourself and I encourage you to do so. It will be good practice. There are other luthier tools that you absolutely need but cannot make such as calipers and set up tools. These you are better off buying and they are typically a lot cheaper than the tools you can make. Below is a short list of essential specialty items necessary to make your guitar building experience easier and more enjoyable. One of the most frequently purchased luthier tools is something to bend sides with. There are all kinds of side bending machines available with all kinds of bells and whistles making them even more unnecessarily expensive. I pre-bend my sides only to make laminating easier. A benefit of laminating is it is not necessary to bend the sides accurately. I use a bending machine to pre-bend the sides. Bending machines will bend most wood nicely but not accurately. My machine is pictured below. I built the machine myself for just over $200 and it only took a day to make. Its an easy project. It works just as good as the ones available at luthier supply companies for over $600. If you are planning to make more than just one guitar the machine is the way to go. You can also bend your sides with a bending iron. Bending sides this way takes a while to get the knack of it. It also takes time to do and is not very accurate even if you are good at it. Most guitar builders that bend thier sides with either an iron or bending machine have to used turnbuckles to keep their sides in shape until the to top and back are glued on. This builds tension into the instrument and should be avoided. It is also cumbersome to work this way. If you are guitar building for a living laminating your sides takes only a minute once you get the mold made and frees you up to do other things. Laminating is dead accurate as well and will give you consistency without tension from guitar to guitar. Get more information about laminating your guitar sides and watch a video..
Another popular luthier tool is a binding/purfling cutter machine. There are a few of machines available in luthier supply stores and they are very expensive. You can make one yourself that will do just a good a job for under $100. I have had mine for 25 years and it still works great. These machines have two parts. A sled for holding and sliding the guitar as you cut, and the cutting machine itself. A laminate trimming router is typically attached to the device. It sits in a carriage that slides up and down following the contours of the back and top of the guitar. Binding channels are difficult to cut. It is difficult to keep the cutter perpendicular to the sides of the guitar as it follows the contours around the perimeter. 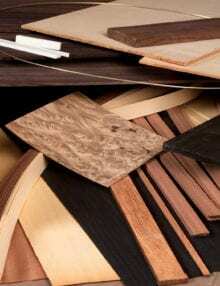 It is therefore difficult to get the bindings to fit without a lot of work after you cut. Binding cutter machines can help with this. The chassis also keeps the router perpendicular to the sides of the guitar. This is important to getting a nice fit. The machine also enables you to cut your binding channels in one pass because you can use a bigger bit. The router is rigidly attached to the carriage which reduces the risk of it kicking back as you cut. I have made some improvements over the years to the first binding cutter I made. The improvements make it more durable, a bit easier to make and less expensive. The plans and some of the hard to find parts will be available in the store soon. An alternative to the binding/purfling cutting machine is an attachment for your router. There are a few binding/ purfling cutter attachments available on the market. Cutting binding or purfling channels with one of these can be a bit scary if you have never done it before. But after a couple of times you will find it isn’t so bad. These attachments typically mount on a laminate trimming router. Larger routers are generally too heavy and cumbersome for this task. The device allows you to cut the binding and purfling channels using a laminate trimmer by hand. As I said its not as bad as it sounds. The way it works is the device touches the guitar in two spots. On the surface of the back or top, and the sides. This keeps the router in position and virtually eliminates the possibility of cutting too deep. You cannot use a bit as large as you can in the machine because you use it hand held. When cutting binding channels with a set up like this it is recommended to make the channel with multiple passes since this is a lot of wood to remove in one pass with a small bit. The purfling channels are typically smaller and subsequently much less wood is being removed so these channels may be cut in one pass. A 1/4″ down spiral bit is recommended for best cutting results. I use a router attachment I designed myself to cut the purfling channels. Use of this device was demonstrated in both the book and the 10-DVD box set. The two-piece attachment is fully adjustable for both the depth and height of the cut and capable of cutting both the purfling and binding channels. Plans for the binding and purfling cutter router attachment are available in the store. One luthier tool that gets a lot of use is a set of thickness calipers. There are many uses for thickness calipers in guitar building. Just about everything needs to be a certain thickness and calipers are the easiest way to measure them. Hand held calipers like the one pictured on the right are what I recommend. These are best purchased from an industrial supply company. Here you will be able to find quality at a reasonable price. Calipers sold at lutheir supply places tend to be lesser quality and more expensive. Since I work in both inches and millimeters I use a digital caliper that can be switched from one to the other. Before these were available you needed two different calipers to do that. These are used to measure the thickness of your sides, braces, bindings, purflings. rosette components, and can measure the thickness of the perimeter of your top and back. For accurately measuring the thickness of your top and back you will need something that can measure thickness around the middle. I use a dial caliper pictured here. You need to rig up something to rigidly hold it in place while extended out far enough to reach the middle of your top. Mine is magnetically attached to a 90 degree steel angle block. I use it to measure the thickness of tops and backs. It is very accurate. Properly built guitars have radiused tops and backs. This doming helps to distribute the forces evenly resulting in a longer life for the instrument. There are other applications for radiused sanding surfaces such as shaping the rims to accept the top and back, the underside of the bridge as well as the top and back braces. To create these radiused surfaces you need some radiused dishes and sanding pads. Sanding disks are another must have luthier tool. Sanding disks are typically about 2 feet in diameter. They are big enough to completely cover the top, back and rims for sanding. The most common size radius for classical guitars are 15′ and 25′ for the back and top respectively. Other radius are sometimes used on steel string guitars. The surface is typically covered with 80 grit sandpaper. These things are big and heavy and can be expensive to buy when you add in shipping costs. But you can make these yourself. It surprises me how reluctant people are to make these. Most people that do rig up some elaborate jig for their router or something. These are not difficult to make by hand and its great practice for things to come. I think most people just don’t have the confidence to try. If that’s the case first make a small one. Perhaps one just big enough to make your own sanding pads with. To make your own you will need a piece of MDF at least 1-1/2″ thick for stability. I glued two pieces of 3/4″ together for mine. There are a number of ways to radius the disks. I have seen all kinds of contraptions with routers and motors to do this. But you can do it by hand just like the way I dish the back work-board in the video. At a minimum you need some radius sticks so have some reference for any dishing you do. All you need is a pair of sticks with the radius cut on one edge. The sticks enable you to accurately measure the surface you are dishing. These are difficult to create accurately since the radius sizes used in guitar building are so big. It will take a bit of thought and work to come up with the radius yourself. I include templates for making your own sticks on all my guitar drawings. I also carry a pair of already made radius sticks available in the store. 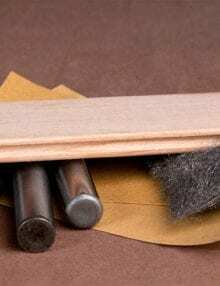 To create the sanding disks and the workboards a set of sanding pads with the radius built in to the sanding surface are very useful if not a necessity. You will need one for each radius. I use them to final radius the sanding disks and work-boards as well as shaping the underside of the bridge. You can create sanding pads easily and accurately if you have some dishes. So its a chicken before the egg sort of thing. I have a pair of radius sanding pads available in the store which are very well made and should last a life time. Making the sanding disks and sanding pads produces a lot of unhealthy dust since they are typically made out of MDF. Make sure you protect yourself if you decide to create these things. Read more about health and safety in the shop. There are a couple of different types of bridge clamping systems available. 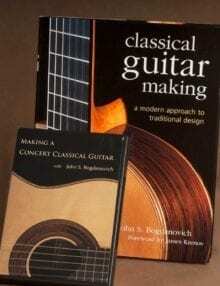 The type pictured on the right is my preferred system for classical guitars. Its a very simple arrangement of clamps and an adjustable plate which reaches out over the wings. The clamps are applied through the sound hole. If you are going to use this system make sure you use a set of cauls under the plate to protect the bridge from damage during clamping. 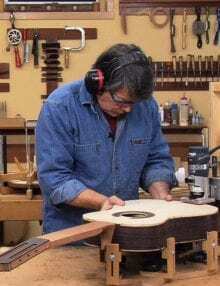 It is very difficult to repair a bridge once it is on the guitar. 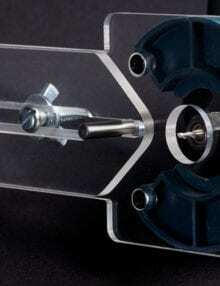 There are also clamping systems available. These are expensive and can cause damage to certain types of finishes. I don’t use one for these reasons. In fact I know very few professional luthiers that use this system. Another solution is cam clamps. Obviously clamps with a deep enough throat are needed to reach the bridge, but this will work.